ACRP Bangladesh is composed of the People of different faiths, viz., Islam, Hinduism, Buddhism, Christianity and Baha’ism. Though this country is known as a role model for interfaith understanding, at times, there are conflicts between and among the people of different faiths. ACRP Bangladesh plays a vital role in resolving these conflicts. 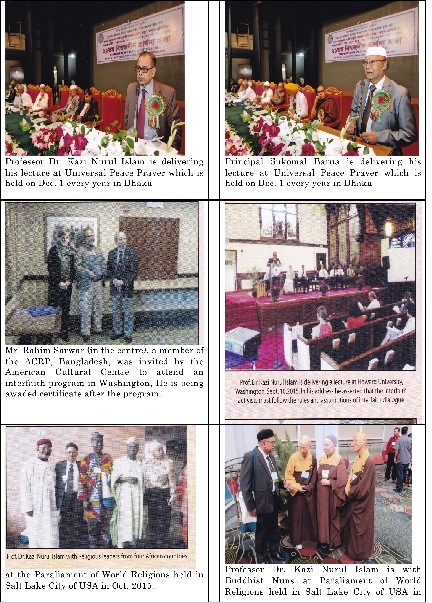 ACRP holds seminars on Interfaith Understanding and arranges Interfaith Harmony Rally on Feb. 1st and May 25th every year. ACRP Bangladesh play and active role in the Universal Peace Prayer held on the 1st December for the last 23 years. The ACRP Bangladesh is composed of many internationally reputed interfaith activists. They all contribute in translating the dream into reality with which ACRP was born. Very often they attend international interfaith program and share their experiences with other members. Program / Project /activity #1 We hold many interfaith program with the youths. -Name and theme of the program Learn Different Faiths and Promote Interfaith Understanding. -Date(s) of the program We hold programs throughout the year. Dates are stated under the photographs. -Contents and context of the program Interfaith and Intercultural Understanding. -Targeted goal(s) of the program To promote Interfaith Understanding. -Perceived significance and impact of the program We are happy that we can motivate our youths. -Articulated issues, problems and challenges of the program We face threats from the fanatics of all religionists. -Recommendations and ways forward in relation to goal(s), significance, impact, issues, problems and challenges cited We need to give more emphasis on the teachings of different religions at school and college levels. ∗Photos of the program are to be attached! Quite a good number of photos have been attached. Professor Kazi Nurul Islam is presenting his keynotepaper on Swami Vivakananda and Interfaith Understanding at Ramakrisna Mission, Dhaka in February 2016.
of Dhaka on the 15th April, 2016. Principal Sukomal Barua is delivering a lecture on What is Interfaith Understanding in a seminar organized by the ACRP Bangladesh held in August 2015. Professor Dr. Azizun Nahar Islam, Head The Women Wing of ACRP Bangladesh is delivering her speech as the Chief Guest of the occssion of 128 birthday of a great saint philosopher of Bangladesh Shree Thakur Anukul Chandra. 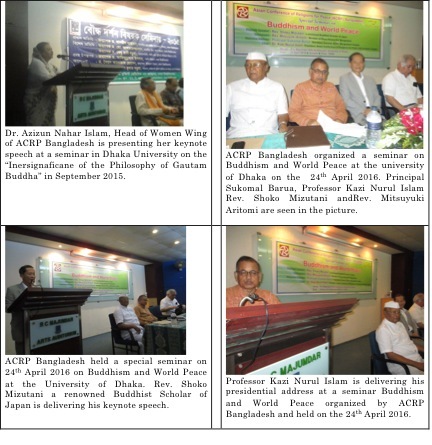 The program was held on the 29th January 2016 in Dhaka.